FREE Groupon Goods! $10 Off $10 Clearance! You are here: Home / Great Deals / FREE Groupon Goods! $10 Off $10 Clearance! 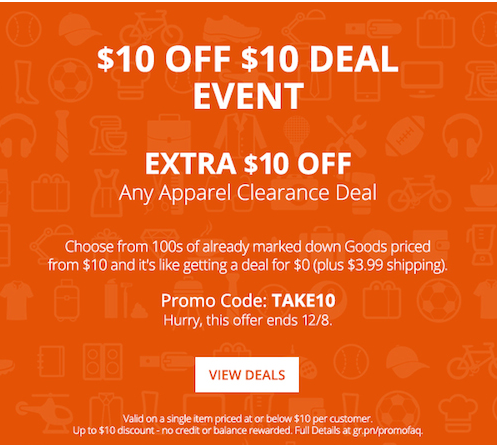 Groupon has a great deal right now where you can get $10 off any $10 Groupon Apparel clearance items! There are plenty of items still available under $10 – plus there are plenty left that are $3 and under which means you could get a few things! Shipping is just $3.99! This is a great deal! Take advantage of it now before it’s all gone! Just use code: TAKE10 at checkout!